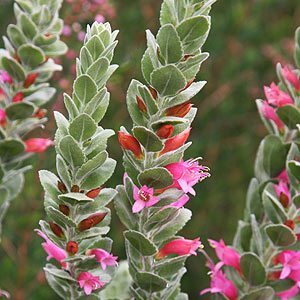 Sometimes you find plants that are rare, and Eremophila calorhabdos x splendens is one of them. It is a hybrid as the name suggests, with a few named cultivars coming onto the market. Reaching around 1m in height with tall flowers spikes, the blooms appear sequentially over a number of weeks from spring to summer. This is a plant that requires full sun and a well drained soil. In its natural environment the soil would be somewhat sandy. In cultivation we would suggest a raised or mounded garden bed to ensure that excellent drainage. Little fertilizer is required, a native plant fertilizer in spring in very poor soils if you must. Mulch around the plants to ensure a cool root run, however not up the stems. Young plants will benefit with protection through the first winter in cooler climates.